Millipore Proflux M12 Tangential Flow Filtration TFF 1568404 Protein Processing . New Life Scientific, Inc.
* The reservoir is absent and the original mounting bolts for the sensor and the knurles were not acquired. This product is in good cosmetic condition, but there are various parts missing that are required prior to application. Please review the photographs carefully. New Life Scientific technicians partially tested this equipment and confirmed the control panel pump responds, but no further testing was performed. This Milipore water filtration unit is a benchtop sanitary-design tangential water filtration system. It is used to concentrate or purify solutions up to 100 liters. 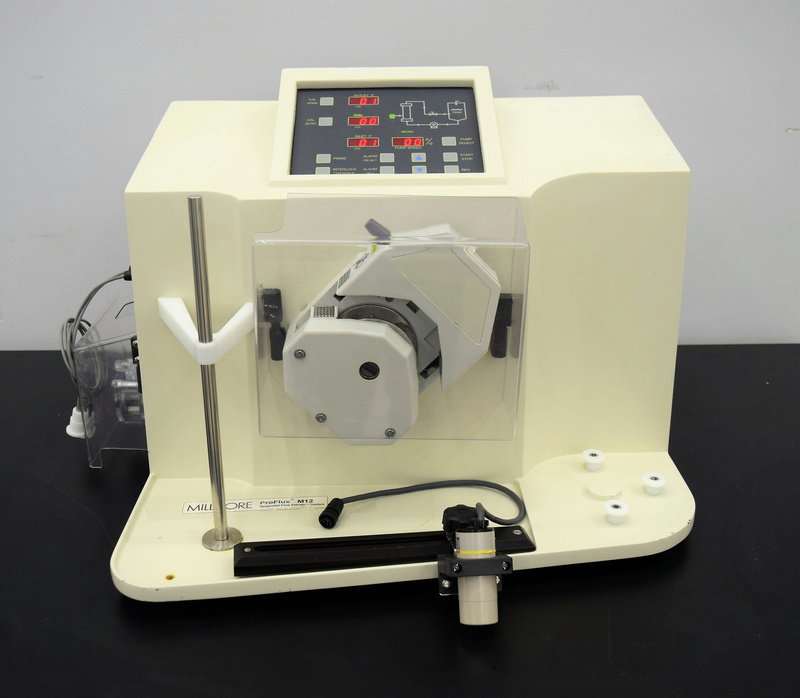 The unit is ideal for microbiology or biochemistry-related laboratory test runs, pilot studies and small-scale production. It has a simple control panel with LCD displays for pressures and pump speed and user adjustable safety limits and alarms. Automated constant-volume diafiltration or continuously fed batch processing of volumes from larger auxiliary reservoirs. Some pieces are missing as listed, but in good working condition.